This colorful Confetti Macaroni and Bean Salad is the perfect addition to any summer soiree. 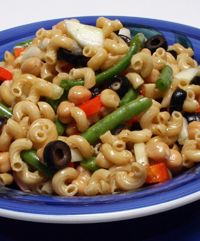 This macaroni salad is low -fat, colorful, as we said and features healthy whole-wheat pasta and fiber-rich beans. then horizontally. Cut pieces into 1/4 inch slices and add to salad. taste with pepper. Add to pasta salad. Toss with fork until well combined. Note: Double the dressing if salad will sit overnight in the refrigerator. carbohydrate, 6 g protein, 4 g dietary fiber, 260 mg sodium.